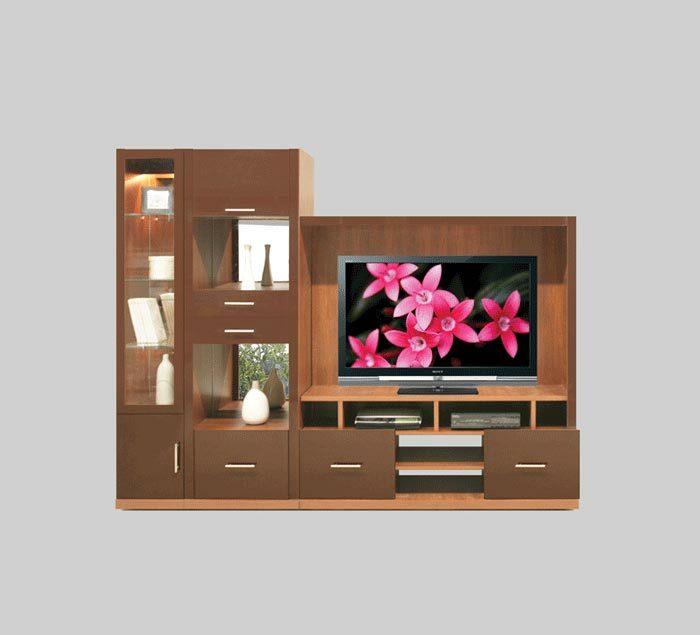 This modern entertainment center is sure to not only accommodate your TV but also offers an abundance of display and enclosed storage all around along with extra component and drawers features. Wall unit features an asymmetrical multifunctional design that perfectly complements any contemporary or transitional decor and space as well as lending itself to the new sleek, flat TV designs popular today and accommodated seamlessly. Positioned off to the right of this entertainment center lies the TV cavity with component shelf below. This area features a closed back with cable management opening making it easy to get the wires where you need them! No more hassle getting your wires in and out and for proper heat ventilation for your cable box, DVD & Blu-ray player, home theater surround sound system, game consoles and any other equipment that you need to properly store and easily connect. An open and drawer storage unit on the left side TV features a closed flip-up door cavity at the top, 2 open compartments with mirror backs, ideal for pictures frame, vases and anything else you would like visible along with 2 smaller drawers in the center and a larger oversized utility drawer at the bottom. Additionally, on the left side of the unit, there is a display unit featuring a clear glass door panel which opens to reveal 3 glass shelves with mirror backs and a backlight accent light fixture at the top along with a closed solid door at the bottom for additional concealed storage space. Finally, 2 oversized utility drawers with full extension ball bearing drawer slides are at the bottom of the TV cavity, perfect for your CD and DVD collection and anything else you need readily accessible and an additional open cavity with a shelf in the middle for those extra components you want to keep in line of sight.